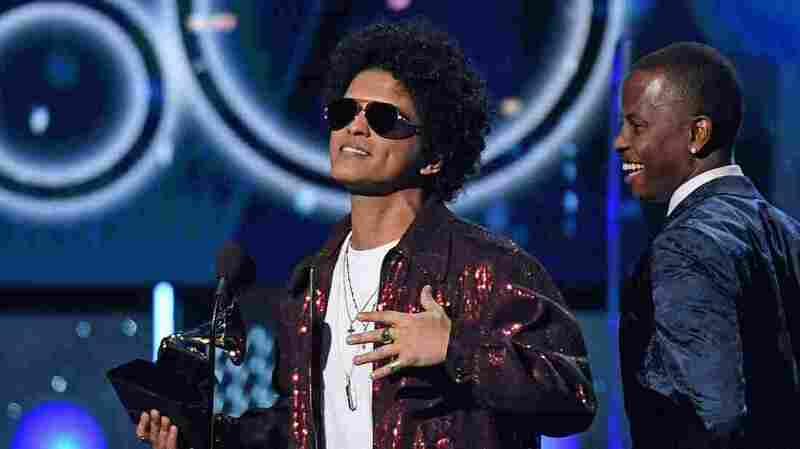 Bruno Mars Sweeps Major Categories At 2018 Grammy Awards : The Two-Way The night, which might have been a fight for supremacy between Kendrick Lamar and Jay Z, ended up being a coronation for Bruno Mars, who won Album, Song and Record of the Year. Bruno Mars received seven Grammys, including Album, Song and Record of the Year. All of the night's most coveted awards went to Bruno Mars, for his funk-infused 24K Magic, which won Album of the Year, and the songs "24K Magic" and "That's What I Like," which won Record and Song of the year, respectively. Mars cleaned up in four other categories as well: Best R&B Performance, Best R&B Album, Best R&B Song and Best Engineered Album, Non-Classical, making him the year's most decorated artist. The night started out looking like it could go in a different direction. After new nomination review committees were implemented in June 2017 for the fields of rap, contemporary instrumental and new age to diversify the nominee pool, hip-hop vet Jay Z walked into the Garden with the most nominations of any artist. Although he was awarded the Industry Icon Award before the televised awards, he lost all eight Grammys for which he was nominated. In the hip-hop categories, all four of those losses came at the benefit of Kendrick Lamar, who started the evening as the second-most nominated artist. His poetic yet pop-appeasing fourth studio album, DAMN. (which was named NPR Music's best album of 2017), won five awards but lost two of the night's three biggest prizes to Mars. "You guys are the reason I'm in the studio pulling my hair out," Mars said to his competitors in the audience when accepting the award for Album of the Year. That speech capped a night when Mars managed a rare sweep of the major awards, a feat also accomplished last year, when Adele beat Beyoncé — Jay Z's wife — in each of the major categories. There were numerous nods to the East Coast location of New York City at this year's ceremony. The 2018 awards marked the first time in 15 years that the Grammys have been held in New York, and there was plenty of star power packed into Madison Square Garden. But while the location may have been touted as historic, there were plenty of missed opportunities to make actual Grammy history. If Luis Fonsi and Daddy Yankee's smash hit "Despacito" had won Song or Record of the year, it would have marked the first time a Spanish-language track won in either category. It lost in every category in which it was nominated. R&B sensation SZA was the most nominated woman of the night but lost all five awards for which she was nominated, including Best New Artist, which was won by Alessia Cara. While the unspoken theme at last year's Grammys was timidly political, the elephant in the room this year dissolved early in the night into the form of dainty white roses, as many on the Grammys red carpet — Lady Gaga, Sam Smith, Lana Del Rey and more — wore flowers with their Grammy ensembles to show solidarity and compassion for victims of sexual harassment and the #TimesUp movement. Though the nod to the movement organized by record executives Meg Harkins and Karen Rait was visible during the pre-show, it barely got any acknowledgement during the first half of the telecast. Lady Gaga was the only performer of the night to work the words "Time's up" into her set. But past the midway point, before announcing a performance by Kesha, Janelle Monae took the moment to wave the flag of sisterhood. "We come in peace, but we means business," Monae said defiantly. "And to those who would dare try to silence us, we say, 'Time's up.' ... Just as we have the power to shape culture we also have the power to undo the culture that does not serve us." Then, for her emotional rendition of "Praying," Kesha was joined on stage by Cyndi Lauper, Camila Cabello, Bebe Rexha, Julia Michels, Andra Day and the Resistance Revival Chorus. The moment was genuine, angelic and exultant, blowing away virtually every other performance of the night. But when it came time to actually award Kesha's efforts, the Grammys did not give her a prize in either Best Pop Solo Performance or Best Pop Vocal Album, the two categories in which she was nominated. In the former category, included on the telecast, her fellow nominees included Kelly Clarkson, Lady Gaga and Pink — all women who have sung about sexual assault or worked with Dr. Luke, the songwriter and producer accused by Kesha of abuse — as well as Ed Sheeran. The award was won by Sheeran, for his hit "Shape of You." Alas, dangling the carrot of more courageous Grammy winners above the nose of music fans proved to be yet another party trick.